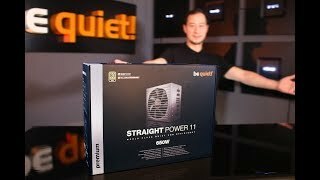 Straight Power 11 | 1000W silent premium Power supplies from be quiet! be quiet! Straight Power 11 1000W raises the bar for systems that demand virtually inaudible operation without power quality compromises. The fan inlet of the Straight Power 11 1000W is funnel-shaped. It causes an increased throughput of air which benefits to a higher cooling performance. An absolute innovation: The Straight Power 11 1000W is wire-free on the DC side inside the PSU body. This results in improved cooling airflow and less signal disturbance, simply because of a lack of wiring, and ultimately pushes the lifetimes of the components to a maximum. Straight Power 11 1000W is certified with 80 PLUS® Gold efficiency, reaching up to 93%. This gives less power consumption and a cooler and quieter operation. Truly a benefit for any system. Only the best components are used in Straight Power 11 1000W. That is why we have built only high-quality Japanese capacitors into the PSU chassis. They are rated to 105°C, ensuring stability, reliability and a long operating life. You are already using a be quiet! 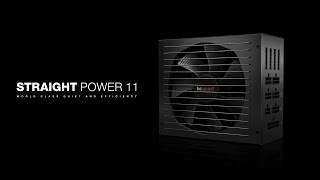 power supply and want to upgrade your system with a new Straight Power 11 | 1000W ? Check here which cables are compatible and don't need to be replaced.